The health benefits of sunflower seeds are plentiful, yet many people aren’t aware of them. Sunflower seeds are a nutrient-dense source of essential vitamins and minerals vital to maintaining good health, including selenium and vitamin E, which may have anti-cancer properties both in the formation of tumors and possibly in slowing down the progression of the disease. Try to choose sunflower seeds that are free from salt and other added flavorings; no need to add excess sodium and chemicals into your body, after all. Buy them in bulk at a health food store or at a grocer who carries a variety of seeds and nuts. Are sunflower seeds healthy? Yes, because they are high in vitamin E, copper, vitamin B1, manganese, and selenium. Sunflower seeds are loaded with nutrition, including a number of minerals and vitamins and lots of phytosterols, protein, fat, and fiber. The main vitamins in sunflower seeds are vitamin E, vitamin B1, vitamin B6, folate, vitamin A, vitamin C, vitamin B2, vitamin B3, vitamin B5, choline, and betaine. From a mineral perspective, sunflower seeds also contain high amounts of selenium, manganese, copper, magnesium, and phosphorus, as well as some calcium, iron, potassium, and zinc. Are sunflower seeds good for you? They are, but because they are high in fat and calories (100 grams has 587 calories) they need to be eaten in moderation. Feel free to toss them in salads, on yogurt, or eat them by the handful. A hundred grams is about three-quarters of a cup, which is quite a lot of seeds, so stick to about one ounce per day on average instead. Below are several possible sunflower seeds benefits. They are a main source of polyunsaturated and monounsaturated fats, two fats that are excellent for overall health. Two nutrients that improve cardiovascular health are vitamin E and folate, both of which are found in sunflower seeds. A quarter-cup of the seeds provides up to 60% of the recommended daily values needed for vitamin E.
An important note about vitamin E—also known as gamma-tocopherol—is that it is a fat-soluble vitamin. This means vitamin E must be consumed with fat, which makes sunflower seeds that much more valuable since they contain both vitamin E and essential fatty acids. Vitamin E is also able to lower levels of inflammation in body. Research shows that inflammation increases the risk of stroke, high blood pressure, and other complications of heart disease. Frequent consumption of sunflower seeds has been found to reduce hypertension, regulate cholesterol, and protect against heart disease. Also, anti-inflammatory compounds and antioxidants in sunflower seeds help reduce oxidative stress and damaging free radicals in the body. Sunflower seeds contain phytosterols that have been linked to healthy cholesterol levels. A study published in the Journal of Agricultural and Food Chemistry showed that sunflower seeds had the highest levels of phytosterols of any nuts and seeds. The phytosterols in sunflower seeds help balance high cholesterol levels, and this can help prevent cardiovascular disease overall. The magnesium content in sunflower seeds can help lower blood pressure and help reduce the risk of heart attack and stroke, but only if you eat them unsalted. Salt and hypertension don’t mix. Because of their high levels of antioxidants, other nutrients, and specific chemo-preventive compounds, sunflower seeds can help prevent cancer and tumor growth. This is supported by numerous studies, including one published in Nutrition Journal in 2004. The antioxidants in sunflower seeds are important for slowing the growth of mutated cancer cells and promoting DNA repair. Research has found that the antioxidant gamma-tocopherol (vitamin E) in sunflower seeds can help in cancer prevention. Studies suggest that vitamin E can specifically help decrease the risk of lung cancer and prostate cancer in men. The selenium in sunflower seeds is another important antioxidant for breast cancer prevention. Research even shows that selenium can help with DNA repair and detoxify the body of damaged cells. Selenium is designed to stop cancer cell proliferation and delay tumor growth through apoptosis—also known as cell death or self-destruction of damaged cells such as those found in tumors. Approximately 27 million Americans suffer from thyroid disorders, and one of the leading causes is a selenium deficiency. The importance of selenium for thyroid health cannot be overstated. Since sunflower seeds are very high in selenium, just a handful daily can benefit your body. Research published in the International Journal of Endocrinology in 2017 reports that selenium is effective for autoimmune thyroiditis and Graves’ orbitopathy, also called thyroid eye disease. The thyroid needs selenium because iodine-based enzymes called iodothyronine deiodinases cannot be synthesized without it. The enzymes seem to help with hypothyroidism prevention and are essential for thyroid hormone activation. So, it is important to stress that iodine cannot function without selenium. Moreover, your body does not produce selenium; it must be obtained through supplementation or food. Therefore, getting selenium from sunflower seeds is a good idea. Once ingested, selenium further breaks down into beneficial enzymes called selenoproteins. These include thioredoxin reductase and glutathione peroxidase. One of the more peculiar health benefits of sunflower seeds is how they can help calm nerves and anxiety, and help reduce the pain associated with migraines. Again, this is thanks to the magnesium content of the seeds. Magnesium deficiency is linked to anxiety and nervousness, and a quarter-cup offers 28% of the daily recommended values of magnesium. Sunflower seeds are high in fiber, and as a result, can help with constipation. The magnesium content in sunflower seeds can help improve overall mental health. Over a hundred years ago, magnesium sulfate was given to patients who were suffering from depression, and today it’s an essential element in treating patients homeopathically to promote good mental health. The vitamin E found in sunflower seeds can protect the skin from oxidative damage caused by environmental exposure and can support the growth of healthy, new skin cells. In the U.S., osteoporosis affects nearly half of all women between 45 and 70 years old. A poor diet is linked to osteoporosis and poor bone health; as such, sunflower seeds can play a big difference in strengthening bone health. The seeds can potentially help reduce osteoporosis symptoms, including a stooped posture, backaches, and bones that break easily. 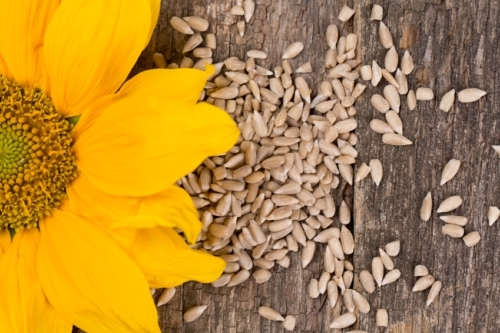 The high amount of magnesium in sunflower seeds plays an important role in bone health. Magnesium helps keep the skeletal structure healthy, and this is important for preventing bone mineral density loss in osteoporosis. Research also shows that magnesium deficiency is linked to osteoporosis. Diets deficient in magnesium may affect bone health, and cause osteopenia, skeletal fragility, and impaired bone growth. In a study published in the Journal of the American College of Nutrition in 2009, researchers observed bone loss and a reduction in osteoblasts in rats with magnesium deficiency. In the U.S., it is estimated that more than 30 million people have diabetes, while 70 million people also have abnormal blood sugar levels. This is often due to the standard American diet, which is high in simple sugars and processed foods such as refined bread, sodas, candies, and baked goods like cookies. It is important to treat diabetes immediately. Left untreated, diabetes can lead to further complications such as weight gain, cardiovascular disease, eye damage (retinopathy), nerve damage (neuropathy), kidney damage (nephropathy), and foot damage. A diet high in nuts and seeds has been found to balance blood sugar levels and reduce hyperglycemia. This helps reduce your risk of metabolic syndrome, diabetes, and insulin resistance. The many nutrients in sunflower seeds help mitigate the complications of blood sugar imbalance that often result from an unhealthy diet. For instance, a meta-analysis of 13 studies involving 536,318 patients published in the journal Diabetes Care in 2011 found that the magnesium in sunflower seeds can protect against type 2 diabetes in particular. Sunflower seeds contain a lot of protein, and protein contains amino acids like tryptophan, which can help boost your mood. The body uses tryptophan to make the neurotransmitter serotonin, which is what helps with mood regulation. Low levels of tryptophan are common in people with depression, tension, anxiety, and nervousness. Tryptophan deficiency may also increase aggression and impulsiveness in those with existing aggression. Eating foods high in tryptophan like sunflower seeds can improve mood and benefit social behavior. Research has found that tryptophan can help those with depression, and improve mood in women with premenstrual syndrome (PMS). Sunflowers also contain omega-3 fatty acids, which are needed for proper brain function and for helping those with depression. What about sunflower seeds’ health benefits for men? Sunflower seeds contain adequate amounts of zinc, which is very important for male fertility. Studies show that zinc can improve sperm count as well as the motility and quality of sperm in infertile men. A lack of zinc in the diet may also cause sperm to clump together. Your diet has a big impact on whether you get enough sleep. The tryptophan found in sunflower seeds plays a role in serotonin synthesis. Tryptophan promotes sleep because the body converts it into serotonin and then melatonin—the hormone that regulates sleep at night. A study published in the journal Age in 2013 found that eating a tryptophan-enriched breakfast and dinner helped adults fall asleep faster and sleep longer in comparison to those eating meals without tryptophan. It is a good idea to add sunflower seeds to your morning oats or smoothie. How Many Sunflower Seeds Are Too Many? Sunflower seeds are incredibly good for us and provide many nutritional benefits, but like everything else in life, they do need to be eaten in moderation. A typical serving is about three-quarters of a cup of unshelled seeds, which is fine to eat every day without worry. The seeds are high in fat, and even though they are sources of good fat, they can still lead to weight gain if you have too many of them, regardless of how beneficial they may be for you. Apart from being high in fat, they are also high in calories, and this can also lead to unnecessary and unwanted weight gain. If you eat unshelled sunflower seeds, you may potentially cause damage to the teeth and gums because of the action of cracking the shells, but this is really only a concern if you’ve had dental work done or if your enamel is weak. Try eating both shelled and unshelled to avoid any damage. Sunflower seed health benefits cannot be disputed, but they should be enjoyed in moderation with other healthy fruits, vegetables, grains, and seeds for a well-balanced nutritional profile. Kids love the fun of cracking into the shells, so it’s an easy way to ensure children gain the benefits of sunflower seeds. Sunflower seeds are loaded with nutrients, such as vitamin E, vitamin B1, vitamin B2, vitamin B3, vitamin B6, manganese, copper, magnesium, phosphorus, and selenium. As a result, sunflower seeds can potentially help treat heart problems, promote sleep, improve your mood, protect against diabetes, support thyroid function, benefit bone health, improve male fertility, calm the nerves, prevent cancer, and more. How can you use sunflower seeds? You can sprinkle them on salads or oats, and put them in your smoothies and baked goods. Sunflower seed butter is also a good alternative for those unable to consume peanut butters or tree nut butters. “5 Health Benefits of Sunflower Seeds,” Global Healing Centre web site; http://www.globalhealingcenter.com/natural-health/health-benefits-of-sunflower-seeds/, last accessed March 24, 2016. “Sunflower Seeds,” The World’s Healthiest Foods web site; http://www.whfoods.com/genpage.php?tname=foodspice&dbid=57, last accessed March 24, 2016.
http://www.healthbeckon.com/benefits-of-sunflower-seeds/, last accessed March 24, 2016. Braverman, J. “What Are the Dangers of Eating Too Many Sunflower Seeds?” Livestrong web site, last updated April 16, 2015; http://www.livestrong.com/article/289308-what-are-the-dangers-of-eating-too-many-sunflower-seeds/, last accessed March 24, 2016. Ventura, M., et al., “Selenium and Thyroid Disease: From Pathophysiology to Treatment,” International Journal of Endocrinology, Jan. 2017; 2017: 1297658, doi: 10.1155/2017/1297658. Donaldson, M., “Nutrition and cancer: A review of the evidence for an anti-cancer diet,” Nutrition Journal, 2004; 3:19, doi: 10.1186/1475-2891-3-19. “Seeds, sunflower seed kernels, dried Nutrition Facts & Calories,” SELFNutritionData; http://nutritiondata.self.com/facts/nut-and-seed-products/3076/2, last accessed August 1, 2018. Rude, R., et al., “Skeletal and hormonal effects of magnesium deficiency,” Journal of the American College of Nutrition, April 2009; 29(2): 131-141, PMID: 19828898. Dong, J., et al., “Magnesium intake and risk of type 2 diabetes: meta-analysis of prospective cohort studies,” Diabetes Care, Sept. 2011; 34(9): 2116-2122, doi: 10.2337/dc11-0518. “Diabetes,” Mayo Clinic; https://www.mayoclinic.org/diseases-conditions/diabetes/symptoms-causes/syc-20371444, last accessed August 1, 2018. Bravo, R., et al., “Tryptophan-enriched cereal intake improves nocturnal sleep, melatonin, serotonin, and total antioxidant capacity levels and mood in elderly humans,” Age, August 2013; 35(4): 1277-1285, doi: 10.1007/s11357-012-9419-5.